The Galapagos sea lion is found in the Gal? ?pagos Archipelago where it is one of the most conspicuous and numerous marine mammals. Well adapted to its semi-aquatic lifestyle, it has a streamlined body and powerful fins, and as a member of the eared seals (Otariidae family), which includes fur seals and sea lions; this aquatic mammal is able to control its hind flippers independently. This adaptation allows it more agility on land than seals, which cannot move their hind limbs independently. 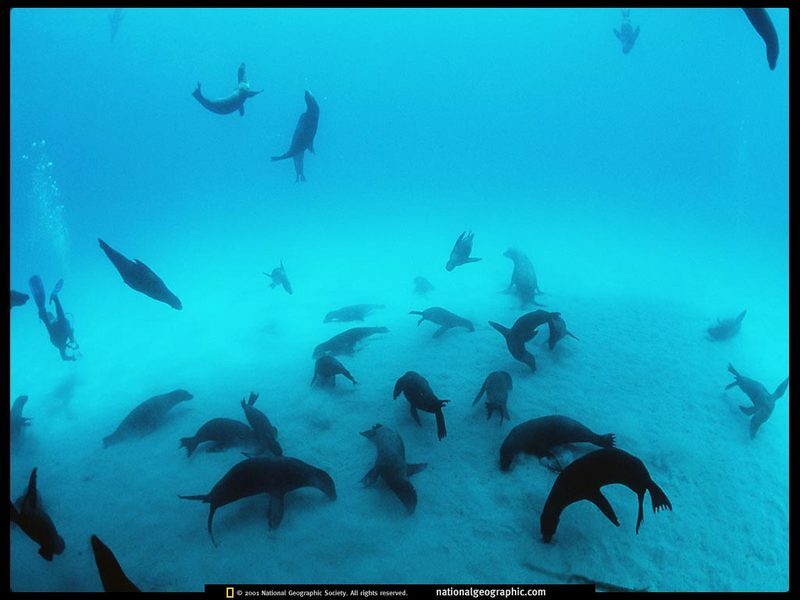 Furthermore, unlike the true seals (family Phocidae), the Galapagos sea lion swims using its strong and well developed fore flippers. Adult males are much larger than females and are brown in colour while females are a lighter tan. Adult males are also distinguished by their raised foreheads, and the hair on the crest may be a lighter colour. Juvenile Gal? ?pagos sea lions are chestnut brown in colour and measure around 75 cm at birth.